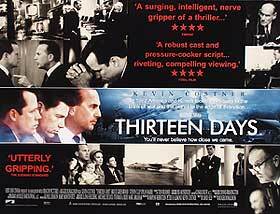 “Thirteen Days” is a thriller about the Cuban Missile Crisis, and how things were worked out, both officially, and through back-channels. President John F. Kennedy had much of his meetings’ dialogue taped, so the screenplay is almost dead-on. Also, Bruce Greenwood’s JFK is a slam-dunk. His actions, his mannerisms—his hair, for crying out loud—all echo Jack Kennedy. Most impressive is his voice. Yeah, JFK had that Boston bray, but he managed to control it most of the time. Greenwood shows the exact same control. Where would Jack be without Bobby? Nowhere, and Stephen Culp gives Greenwood a perfect foil. The accent is there, but it’s natural, not overbearing, and the chemistry between Culp and Greenwood represents perfectly the legendary Kennedy brothers teamwork. According to the director’s commentary, Greenwood and Culp would go off-set and argue in their JFK & RFK voices, just to keep their accents and vocal mannerisms sharp. Sadly, the film is told through the eyes of longtime Kennedy friend and political advisor, Kenny O’Donnell (Kevin Costner). I’m good with accents. In “V for Vendetta,” I could tell when Natalie Portman’s accent slipped a little from one part of England to another (though these were very rare, very minor, and she was hugely impressive for a twenty-year-old American girl). I was born and raised in West-Central Florida. We don’t really have much of an accent, because so many people have moved here from all over the country, it’s sort of a melting pot. My mom’s family, however, lived in that part of Lookout Mountain where Tennessee, Alabama, and Georgia are all within spittin’ distance. Within ten seconds of being there, I’m “y’all”ing with the best of ‘em, bless their hearts. Similarly, when I went to New Orleans for Mardi Gras, I picked up the accent there. One summer, I hung around a bunch of friends from Maine, and I picked that one up too. I like Kevin Costner as an actor most of the time. Even here in “Thirteen Weeks,” there are times he shows skill and gravitas. It just isn’t when he’s talking. Not only do the words come out all obviously ovah-done, he does this high-pitched cartoony thing with his voice too. It’s sad, because it’s a blemish on an excellent resume. From what I’ve read, Costner’s character—Kenny O’Donnell—also had waaaaaay less to do with the decision making process than did the rest of the staff. I can’t speak either way about that, but I’ve read that in a couple of different places. Honestly, that’s not really relevant. Costner’s accent aside, this ensemble cast works beautifully together. “Thirteen Days” is a taut, engaging thriller, and we can see how close we were to a possible nuclear war. God bless Adlai Stephenson (at least in the movie). And who knows? Maybe Costner’s accent was what finally eliminated “The Curse of The Bambino,” and let the Red Sox win a series. Thirteen Days is on YouTube in its entirety—for how long, I don’t know. This entry was posted in Based on a True Story, Films, Films Watched in 2014. Bookmark the permalink.